The Library of the University of California, Los Angeles (UCLA), USA, held a symposium on February 20th to commemorate the opening of the Yoshida Yoshie Collection―a collection of materials on Yoshida Yoshie donated to the library. 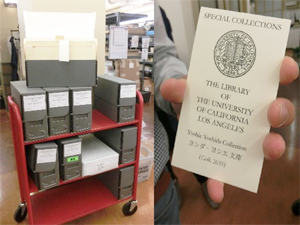 Kikkawa from the Department of Art Research, Archives and Information Systems of Tokyo National Research Institute for Cultural Properties took this opportunity to visit the UCLA Library system’s sections and units related to special collections (archives). Accompanied by Tomoko Bialock, Japanese Studies Librarian of the university, Kikkawa made a tour of the East Asian Library (second floor of the Charles E. Young Research Library), Special Collections (basement of the same library building), Conservation Center (Powell Library), and the Southern Regional Library Facility. During the tour, Kikkawa met with specialists in charge of conservation treatments, creation of finding aids, digitization of individual items, and long-term preservations, who explained to him how to select, accept and conserve special collections and how to allow library users to access them, by using the Yoshida Yoshie Collection as a case study. He also discussed and exchanged information with each specialist about the situation surrounding special collections in Japan in the field of art. 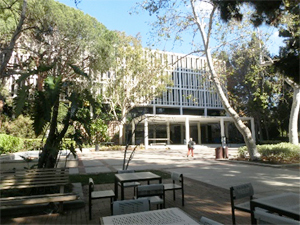 Through the tour of the UCLA Library, a library of one of the largest universities in the U.S., which accepts an enormous number of special collections in a variety of genres, including those on politicians, historians and literary figures, Kikkawa learned firsthand about its sophisticated system of accepting materials into special collections, and about the job specialization that allows each staff member to exercise his or her expertise. This visit provided him with an opportunity to realize once again the differences between the U.S. and Japan in terms of structural factors, including the arrangement of staff and the budget size allocated to special collections. A report of this visit will be presented and shared with relevant individuals and parties at a seminar to be held in May by the Department of Art Research, Archives and Information Systems. The Sainsbury Institute for the Study of Japanese Arts and Cultures in Norwich, UK is one of the hubs for the study of Japanese arts and cultures in Europe. The Sainsbury Institute and Tokyo National Research Institute for Cultural Properties have been jointly engaged since 2013 in the Project to Shaping the Fundamentals of Research on Japanese Art. As part of the project, researchers of the Department of Art Research, Archives and Information Systems annually visit the Sainsbury Institute to offer consultation on the project and deliver a lecture. In the FY 2017, three researchers, Jun SHIOYA, Takuyo YASUNAGA, and Tomohiro OYAMADA, stayed in Norwich from February 13th through 16th, 2018 for that purpose. As for consultation, we discussed the measures to be taken for the development of this project with Dr. Simon KANER, Head of the Centre for Archaeology and Heritage, and the staff members at the Sainsbury Institute, Mr. Akira HIRANO, Ms. Keiko NISHIOKA, and Ms. Miwako HAYASHI. Specifically, we talked about the English translation of the “Year Book of Japanese Art” (published annually by this Institute), improvement of the quality of basic information available on the names of Japanese writers included in the database, and so on. 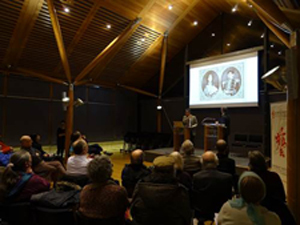 On February 15th, a lecture by Jun SHIOYA was held at the Weston Room of Norwich Cathedral. This was organized as part of the monthly seminar for general audience held on the third Thursday by the Sainsbury Institute. A researcher from this Institute annually delivers a lecture there since 2014. Jun SHIOYA made a presentation titled “Respect, Curiosity and Taboo – Differing Visual Expressions of the Meiji Emperor,” which was interpreted by Dr. Kaner. Based on the book titled “Art History of the Imperial Court 6” (published by Yoshikawa Kobunkan), for which Jun SHIOYA served as a representative author, he discussed the development and the limits of the visual expressions of the emperor in modern Japan by introducing a discussion on the portraits of the Meiji Emperor by Ms. Keiko MASHINO. These portraits are placed in the book while referring to the lese majesty, which was believed to have been committed by a journalist named Gaikotsu MIYATAKE, and the caricature of the Meiji Emperor in Europe. The seminar attracted an audience of around 80 people, including researchers such as Mr. Toshio WATANABE, Emeritus Professor at University of the Arts London and Professor at the University of East Anglia, and Dr. Barak KUSHNER, Associate Professor at the University of Cambridge, in addition to regular local participants. During the Q&A session after the lecture, a lot of questions were asked by the participants, which indicated high interest in Japanese cultures in the UK. From January 23rd to February 13th, 2018, we carried out conservation and restoration work on the outer walls of Me-taw-ya Temple (No.1205), a brick temple at the Bagan Archaeological Site in Myanmar, aiming primarily at protecting mural paintings from rain leaks. 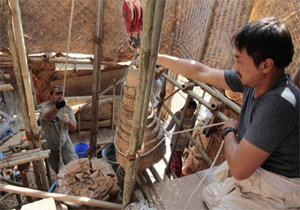 Our work during this mission focused on restoring the pinnacle’s of the temple damaged by the earthquake on August 24th, 2016, as well as conserving and restoring the stucco decorations left on the dome of pagoda. While in Bagan, we also held a workshop for young conservators at the request of the Bagan Branch, Department of Archaeology and National Museums, the Ministry of Religious Affairs and Culture of Myanmar. In this workshop, we provided technical training on how to use restoration materials, with the aim of helping young conservators to better understand the characteristics and effects of each restoration material through actual restoration processes. In addition, we conducted studies on art history, iconography and the evolution of mural painting techniques in Myanmar, Since we were finished, for the time being, with the studies on mural paintings from the 11th to 13th centuries, the prime of mural paintings, in our earlier missions, we left Bagan and headed to Phowintaung Cave and Kinmun Village near Monywa to study mural paintings from the 17th to 18th centuries, which can be described as the “revival period.” Through these field studies, we were able to gather a great deal of information. On February 9th, we visited UNESCO Yangon Office, and explained what we, at Tokyo National Research Institute for Cultural Properties, have achieved so far through our conservation and restoration work as well as our studies of Me-taw-ya Temple. The officials at the Yangon Office highly commended us for our consistent project that focuses on the conservation of mural paintings and for our processes of promptly starting the restoration of earthquake-damaged areas. We and the UNESCO Yangon Office agreed to share information and develop a cooperative relationship from this point forward. We have now completed the restoration work in the areas severely damaged by the earthquake. From fiscal 2018 onwards, we will gradually shift our focus from the restoration of the damaged areas to the project’s original purpose, which is the conservation and restoration of the outer walls to protect mural paintings from rain leaks. We will continue to work on developing effective policies for conserving and restoring the Bagan Archaeological Site through extensive discussion with local experts.